JUBA (HAN) December 20.2016. Public Diplomacy & Regional Security News. A South Sudanese rebel commander has dismissed as untrue allegations that they received guns from the United Nation Mission in South Sudan in the oil-rich Unity state, prior to the mid-December 2013 outbreak of civil war. In an interview with Sudan Tribune on Saturday, Gen. James Koang Chuol, denied any knowledge about alleged delivery of UN weapons to the opposition forces. The said report, Choul stressed, also failed to mention how the guns were sent to the armed opposition territories, as it was earlier alleged. The rebel official strongly denied allegations that their forces targeted and raped civilians in the Unity state capital, Bentiu after they recaptured the town from pro-government troops in April 2014. “I would like to clarify that this report is not true. We haven’t killed any civilians, not even a single civilian in Bentiu town. This is not true, it is a real fabrication of lies from those who have reported it”, he said. Choul said when the fighting started in the heart of Juba on 15 December, 2013, he was at the time in charge of the fourth division headquarters in Unity state and that he protected all civilians. 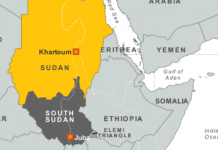 The killing of civilians in the oil-rich Unity state, he further said, were carried out by the Justice for Equality Movement (JEM), a Sudanese rebel group operating in Sudan’s western region of Darfur. Sudan Tribune was unable to independently verify the rebel official’s claims. A senior United Nations official recently warned of possible genocide in the young nation, should the international community fail to address the ongoing conflict between South Sudan’s warring factions.